Computers, laptops and accessories, and IT gadgets will be sold at discount prices during Rangoon’s first information and communications technology (ICT) fair of 2017. 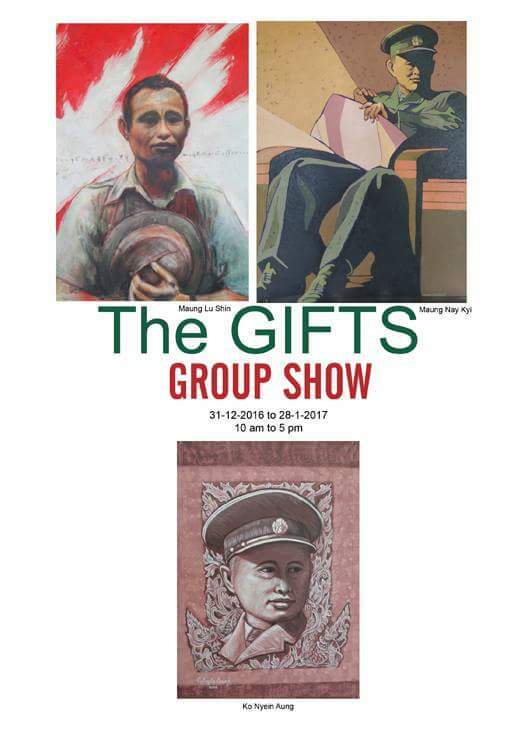 Jan. 6-8, 9am-5pm, Tatmadaw Hall, U Wisara Road. A dance performance led by famous dancer K MiKo along with songs by famous vocalists Tun Eaindra Bo, Sone Thin Par, and Phoe Pyae Sone, among others. Jan. 7, 7pm. National Theater, Myoma Kyaung Street. Tickets 10,000 to 30,000 kyats. A unique unplugged experience from folk to reggae, oldies to recent tunes. LNR Band is a fresh and new local band in town—they will light up your night. The band usually plays cover songs, such as songs by John Legend, Ed Sheeran, Jason Ross, and Bob Marley. But they also write their own songs in both English and Myanmar. Jan. 7, 7-10pm. Rose Garden Hotel, Upper Pansodan Street. 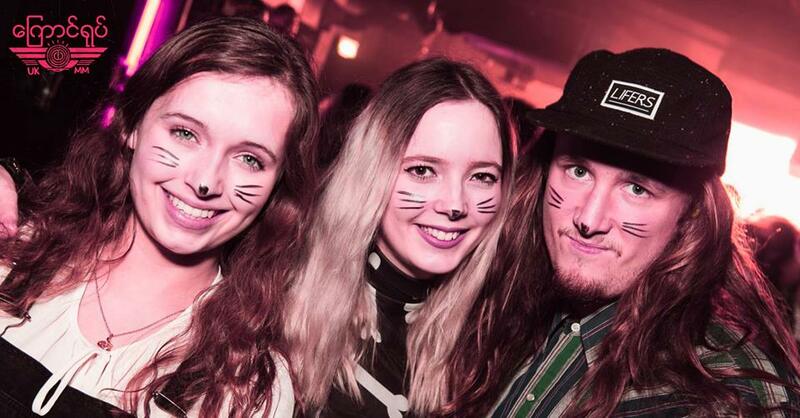 Have fun having whiskers drawn on your face! All proceeds go to selected charities across Burma. Jan. 8-9, 7:30pm-1:30am. The Vibe, Kan Yeiktha Street, Bahan Tsp. Tickets 7,000 kyats. 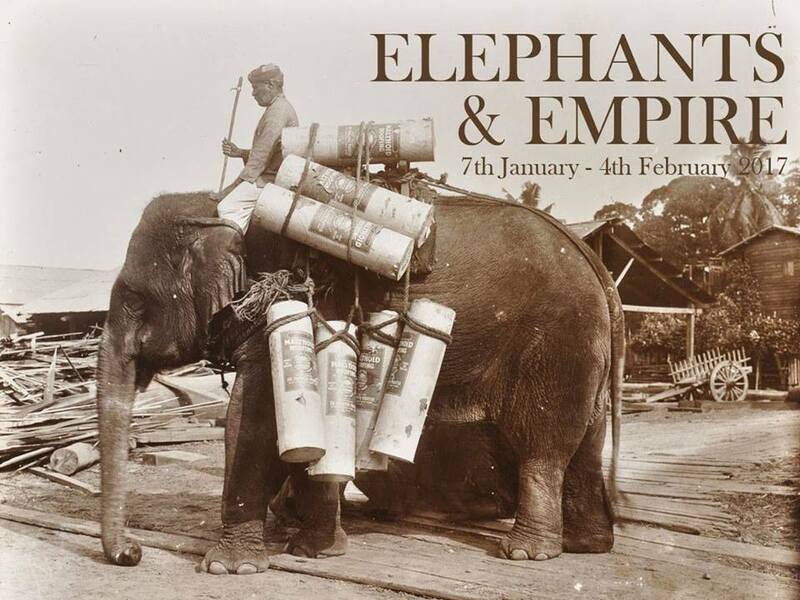 Discover the current challenges facing Burma’s elephants in this exhibition of archive photographs organized by the University of Leeds. At the end of the exhibition the photographs will go to the Green Hill Valley Elephant Camp near Katha, a family-run camp for retired working elephants. Jan. 7- Feb. 4, (closed on Mondays), 10am-5pm. Myanmar Deitta 3rd floor, No.49, 44th Street. 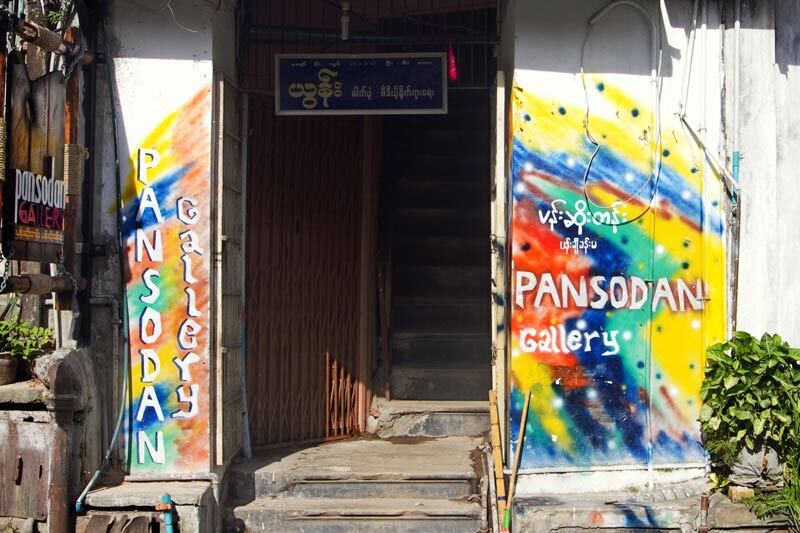 Every Tuesday evening Pansodan opens up its Gallery Space for a gathering, during which all sorts of people interested in Burma’s future enjoy conversation and perhaps some beer. Expect guitars to come out after midnight. Every Tuesday, 7-10pm. Pansodan Gallery, Pansodan Street. Free. 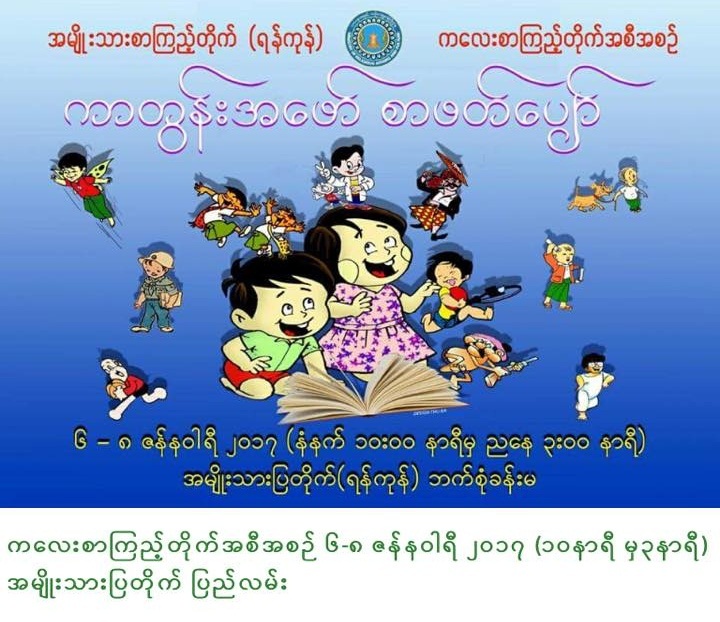 The National Library (Rangoon) will organize an event to help cultivate positive reading habits among children. The event will include story-telling, painting, and coloring by children. A group art exhibition of over 30 artists, to feature around 50 works in different mediums. Until Jan. 28. Eternal Art Gallery, Yuzana Garden Housing. 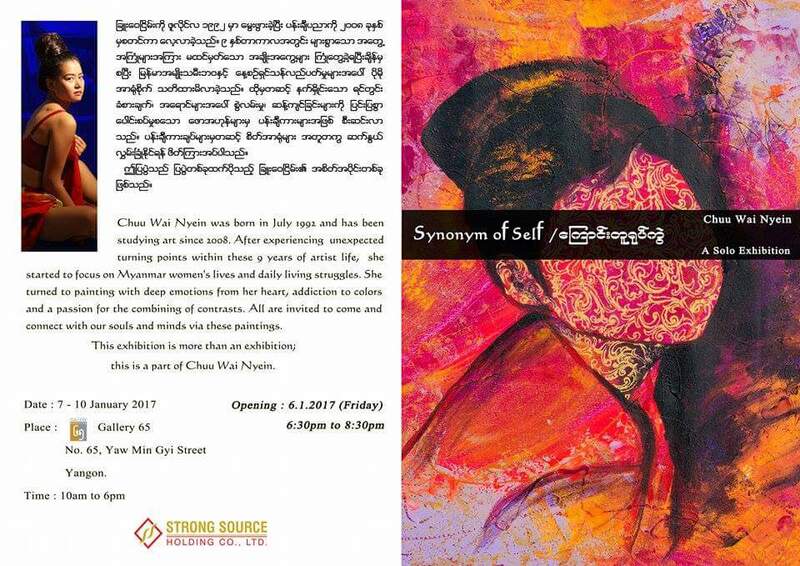 Artist Chuu Wai Nyein from Mandalay will showcase around 40 acrylic works depicting the lives and struggles of women. This will be her first solo exhibition in Rangoon. Jan. 6-10. Gallery 65, No. 65, Yaw Min Gyi Road, Dagon Tsp. 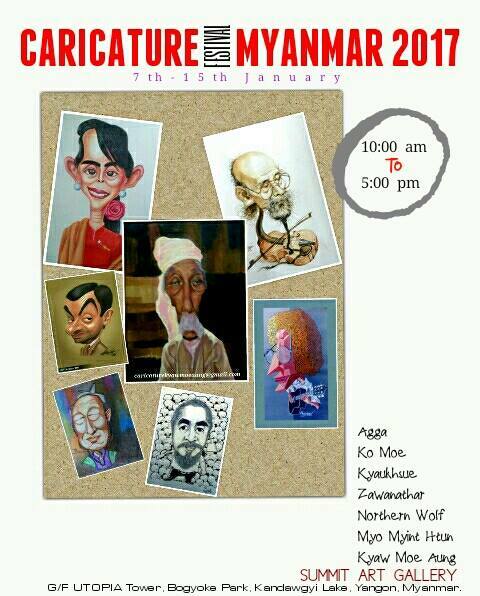 A group caricature show by seven caricature cartoonists will be held at Summit Art Gallery, featuring about 40 caricature paintings. On opening day at 10am, cartoonists will draw caricatures of political prisoners who will also perform to songs.